How Many Stations Could Use This Step-Free Layout? Greenford station has London Underground’s only inclined lift. The inclined lift is installed with an escalator on the other side and double-width stairs with a central rail in between. Searching the Internet, there doesn’t seem to have been any problems, since it was switched on in 2015. The number of passengers using the station’s two Central Line and one National Rail platforms is around five million per year, which would appear fairly typical for many outer London tube stations. So how many stations could use a layout like this? These issues will need to be considered. Greenford station is not a great height difference and you wouldn’t want to have too much of a difference, as the stairs will get a heavy use. Greenford station has an island platform, which means that one set of inclinced/lift/escalator can serve all platforms. The picture shows that the combined installation is quite wide, so this type of step-free access could be difficult to install. There are lots of stations in the outer reaches of the Underground, which need step-free-access, where there are two escalators and a set of stairs. Some might think, that an inclined lift could be put in the space and it would certainly the engineering wouldn’t be difficult. But the problem would be long-term maintenance, where escalators are given a full strip-down every ten years or so and closed for several months. The station would be left with just one working escalator and the inclined lift. I would therefore feel that installing an inclined lift instead of the stairs is not a feasible proposition, unless the station has two entrances. Most deep-level stations on the London Underground have banks of three escalators, so that if one breaks down or is being maintained, there is a full service. There are lots of stations, that need step-free footbridges. I can envisage a prefabricated system, where an inclined lift is one of the components. The lift and its frame would be assembled in a factory and just lifted into place on prepared foundations. Stairs and if needed, an escalator could also be handled in the same way, before the bridge deck was lifted on top. Too many step-free footbridges, seem to require a lot of bespoke construction on site. The system could also be used where the entrance to a station was a single set of stairs to an island platform from an existing overbridge. Bowes Park, Rose Grove and Mill Hill come to mind. 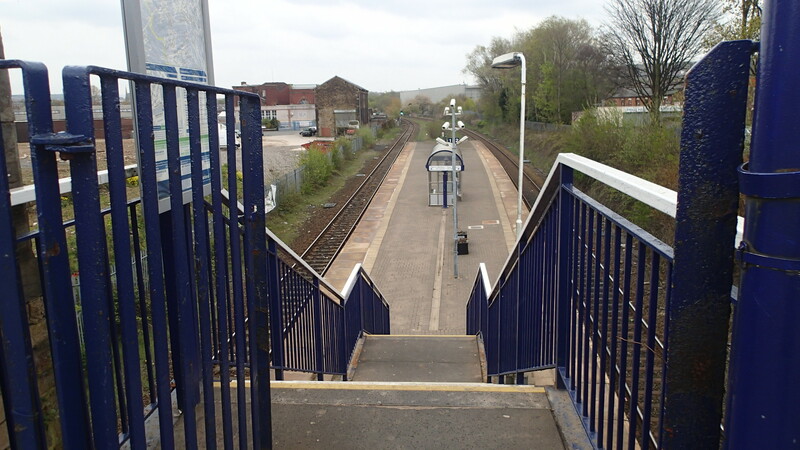 This picture shows Mill Hill station in Lancashire. There must be others, where the existing stairs could be replaced with a wide staircase and an inclined lift. 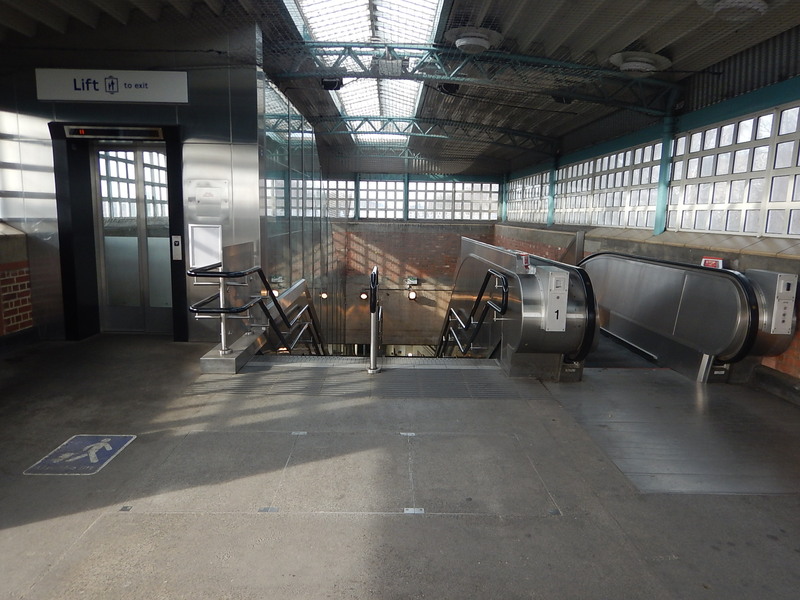 I think it is likely, that given the success of the Greenford installation, we will see other inclined lifts on the UK’s railway network. But places where they are used will have to be chosen with care and well-designed!